TO celebrate National Cash for Kids Day, Heads of Ayr Farm Park is planning a fabulous charity Family Fun Day in aid of Westsound Radio’s charity. 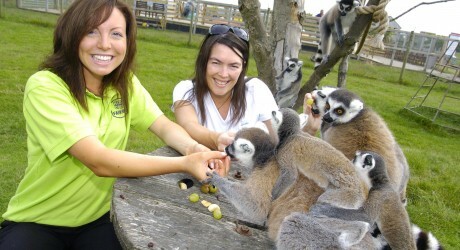 Doors open at 10am on MONDAY 30 MAY 2011, for the fun-filled day which will feature the Heads of Ayr Healthy Living quiz with prizes, face painting, balloon modelling, funfair games, a variety of stalls and talks from the animal keepers at the farm park! As well as a DJ playing from noon until 4pm, West FM presenter, Jen McGinley will be attendance at 2.30pm pm to join in the fun, and Cash for Kids mascot, Courage the Cat will be on hand to entertain, with his usual antics. And of course, there will be the animals, large and small, including exotic imports like Zebus, Squirrel Monkeys, Meerkats and Skunks, as well as Ralph the Camel, to meet and play with! Optional additional charges are:-Adult quads (12 yrs + and min. height restriction 5ft) £6, Child quads (7-11 yrs) £5, Quad & barrel ride (max height 5’ 6”) £1.50, Electric diggers, tractors and quads £1, Bumper Boats £2, Water Wars £1 per bucket, Quacky Racers £1 per duck.